It’s no secret that I am a huge fan of Monkisee products. I’ve used the line since my son was 10 months old and have had tremendous success with them as far as object recognition, shapes, colors, and reading. I am so excited that Monkisee is about to launch a new line of products, Howie and Skip’s Storytime, which will include Bible stories! 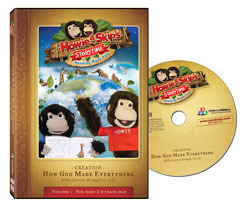 The very first Storytime DVD, “How God Made Everything” (which teaches children about the first week of creation in an engaging and entertaining way) is available for pre-order now for only $9.95.